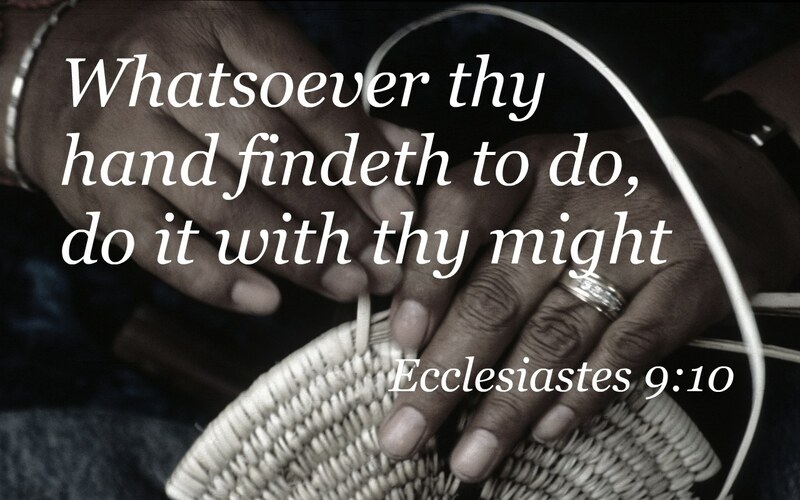 A Meditation on Ecclesiastes 9:10. “Whatsoever thy hand findeth to do,” refers to works that are possible. There are many things which our heart findeth to do which we never shall do. It is well it is in our heart; but if we would be eminently useful, we must not be content with forming schemes in our heart, and talking of them; we must practically carry out “whatsoever our hand findeth to do.” One good deed is more worth than a thousand brilliant theories. Let us not wait for large opportunities, or for a different kind of work, but do just the things we “find to do” day by day. We have no other time in which to live. The past is gone; the future has not arrived; we never shall have any time but time present. Then do not wait until your experience has ripened into maturity before you attempt to serve God. Endeavour now to bring forth fruit. Serve God now, but be careful as to the way in which you perform what you find to do—“do it with thy might.” Do it promptly; do not fritter away your life in thinking of what you intend to do to-morrow as if that could recompense for the idleness of to-day. No man ever served God by doing things to-morrow. If we honour Christ and are blessed, it is by the things which we do to-day. Whatever you do for Christ throw your whole soul into it. Do not give Christ a little slurred labour, done as a matter of course now and then; but when you do serve Him, do it with heart, and soul, and strength.